Rowing is a very popular form of indoor exercise today. 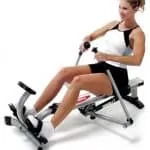 But as it is, not many people are exposed to the activity while growing up, so you might easily find it intimidating to jump aboard the rower bandwagon. Though mastering the art of rowing takes some getting used to, there are a few tips that can escalate the learning process and hone your rowing skills from novice to expert in just a matter of days. To handle rowing machines effectively, there are three things you need to master: the order, the power and the timing. These three things pretty much sum up the art of rowing. Suppose you are clueless about the rowing activity and you watch a professional rower in action, you may wonder how they are doing it so well. The secret is in the order (also it may have to do with picking the best rowing machine). And anyone can master the order with a little practice once you have the idea. Rowing follows a very specific order: legs first, then core, and finally the arms to make a complete backward stroke. While it may appear to many people that all these body parts move at once because this is a total body activity, the truth is different. The motion actually follows a linear progression technique. Those body parts initiate motion at different times in the stroke. A frontward stroke simply takes the reverse arrangement of the backward stroke, with the arms moving to the front first, followed by the core and finally the legs. It is because the entire process is seamless that a single stroke tends to appear as being a single movement to a nonprofessional eye. It becomes really difficult to get your timing, power and desired results if you don’t follow the right rhythm. Doing your rowing stroke out of order may be unhealthy, dangerous even. Dangerous because you may hurt your back by putting too much strain where it shouldn’t be. Suppose you try for instance to lean back a little earlier than required, you’ll be straining your back. Such a motion means you’re trying to initiate your core to move backward before straightening your legs. As a result, your back assumes an inclined angle that exerts undesirable strain on it. So if you’ve heard someone complain about back pain from rowing, you can now have an accurate idea of what went wrong. If you follow the right order in rowing, then you’ll never feel the back pain – the order evens out the impact on your whole body to deliver the right results. 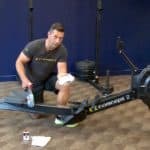 How you distribute power on your primary target body parts while rowing – the legs, the core and the arms will determine which part gets tasked the more. Normally your legs are supposed to do most of the work, with your core and arms having equal distribution of the total rowing power. In essence, your core and arms should each do only about a third of what your leg is doing in each stroke. Why should the legs have the lion’s share of power, you wonder? You don’t want to get tired prematurely. 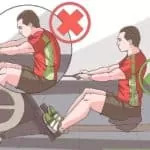 Suppose you task your arms by pulling further and more powerfully on the last couple of inches, you’ll only last for a few minutes on the rower before your arms get really tired. Of course you may redistribute power in that manner if you want to maximize the impact on your biceps and shoulders. But that’s upon you to decide; particularly when you get higher on the rowing scale. If you were to plot the time you take on your backward stroke against that you take on the frontward stroke respectively, the ratio would be 1:2. For every one count on a backward stroke, there should be a corresponding double count on the forward stroke to achieve the right motion. The backward stroke is a power motion and should be forceful, while the forward stroke should be slower (half the pace of the backward stroke) to allow your body enough recovery. There you have it: put these tips into practice and you’ll soon be rowing like a pro.